Gerry James, born in Regina in 1934, grew up in Winnipeg and played sports at Sir John Franklin Community Club. He was, of course, better known in football. He played for the Winnipeg Blue Bombers while still in high school and went on to become one of the best ball carriers in the country. But the Toronto Maple Leafs liked his hockey skills. While still a juvenile player he participated in the 1951 Memorial Cup final with the Winnipeg Monarchs. 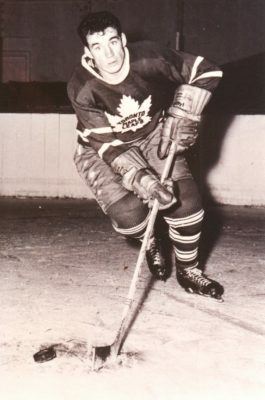 He was also part of the Toronto Marlboros 1955 national junior championship team and later played in the1960 Stanley Cup final with the Leafs.